This medical director form is designed to document a medical products company's independent contractor agreement with its medical director. The agreement defines the medical director's responsibilities at the company, the administrative services he must provide, and his availability and time commitment. The medical director is paid a fixed monthly salary in addition to stock options from the company. The medical director may engage in other consulting activities for third parties during the term of the agreement, but the medical director must inform the company in writing identifying the third party and the general nature of the competing consulting assignment. The form contains a nonsolicitation provision which prohibits the hiring of the medical products company's employees or independent contractors by the medical director during the term of the agreement and during the year following the termination of the agreement. The form also provides for the protection of the medical company's confidential information, and covers inventions and patents which may arise from the medical director's activities. This Medical Director Agreement (the "Agreement") is entered into effective ____________, 20__ (the “Effective Date”) by and between Medical Products Company, Inc., a ___________ corporation ("Medical Products Company" or "Company"), and Competent Physician, MD ("Physician"). 1. Consulting Relationship. During the term of this Agreement, Physician will serve as Medical Director of the Company, and in that capacity Physician shall have such rights, powers, authority, functions, duties and responsibilities as the President and Chief Executive Officer and/or Executive Chairman may assign to Physician from time to time that are commensurate with Physician’s status as Medical Director. Without limiting the foregoing, Physician will be actively engaged in and working with the President and Chief Executive Officer, together with other officers and employees with regard to (i) development of new products, (ii) design and implementation of pre-clinical and clinical studies and (iii) regulatory activities including advice regarding US FDA regulatory submissions. Physician shall be responsible to and shall report to the President and Chief Executive Officer. As needed and upon request, Physician will participate in meetings of the Board of Directors of the Company, as well as investor presentations. Physician shall devote such time and attention to the business of the Company as is reasonably necessary to fulfill Physician’s responsibilities as Medical Director. Cash Fee: $______ per annum, payable in monthly installments in arrears. Stock Options: Non-qualified stock options to purchase ______ shares of common stock, exercisable as to ______ shares at $____ per share (or such higher price as is equal to fair market value on the date of grant) and as to the remaining _______ shares at $___ per share, the lower priced options vesting in full on the first anniversary of the date of grant and the higher priced options vesting in full on the second anniversary of the date of grant, and expiring on the tenth anniversary of the date of grant. The options shall be granted on the Effective Date or as soon thereafter as is reasonably practicable. 3. Expense Reimbursement. Physician shall be entitled to reimbursement for reasonable travel and other out-of-pocket expenses incurred by Physician in the performance of services rendered hereunder following submission of written expense statements and other supporting documentation in accordance with the policy and practice of the Company. 4. Term and Termination. The term of this Agreement shall commence on the Effective Date and shall continue until _______, 20__, subject to automatic extension for successive one-year periods unless either party provides written notice to the other of its intention not to renew at least ten days prior to the then scheduled expiration date. Notwithstanding the foregoing, either party may terminate this Agreement at any time prior to its then scheduled expiration date, upon thirty (30) days prior written notice to the other party if termination is without cause, and upon written notice to the other party if termination is as a result of a breach by the non-terminating party. 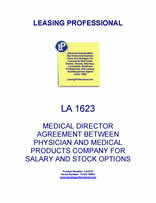 Upon termination of this Agreement, neither Physician nor the Company shall have any further obligations under this Agreement, except that any liabilities accrued through the date of termination (including, without limitation, those under Sections 2, 3, 5, 7, and 8) shall survive termination. (a) Relationship. Physician's relationship with the Company will be that of an independent contractor and not that of an employee. (b) No Benefits. Physician acknowledges and agrees that Physician will not be eligible for any Company employee benefits and, to the extent Physician otherwise would be eligible for any Company employee benefits but for the express terms of this Agreement, Physician hereby expressly declines to participate in such Company employee benefits. (c) Withholding; Indemnification. Physician shall have full responsibility for applicable withholding taxes for all compensation paid to Physician under this Agreement. Physician agrees to indemnify, defend and hold the Company harmless from any liability for, or assessment of, any claims or penalties with respect to such withholding taxes, including any liability for, or assessment of, withholding taxes imposed on the Company by the relevant taxing authorities with respect to any compensation paid to Physician, as well as reasonable legal fees incurred in connection therewith. 6. Other Activities. The parties acknowledge that Physician has from time to time been engaged, and may during the term of this Agreement continue to engage, in consulting activities for third parties in the fields of _______________ and such other fields as the Company may, from time to time, pursue (“Competing Fields”). On or before the Effective Date, Physician shall inform the Company in writing of each such engagement pending as of such date, including the name of the party for whom the services are performed and the general nature of the engagement. During the term of this Agreement and the three-month period thereafter, the Physician shall inform the Company in writing of any material changes to such engagements and, at least thirty (30) days prior to the commencement thereof, the commencement of any new such engagement. The Company will honor Physician’s requests for confidentiality regarding this information.